Who will retrieve the most gold from the Temple of the Elder Elemental God and make it out alive? 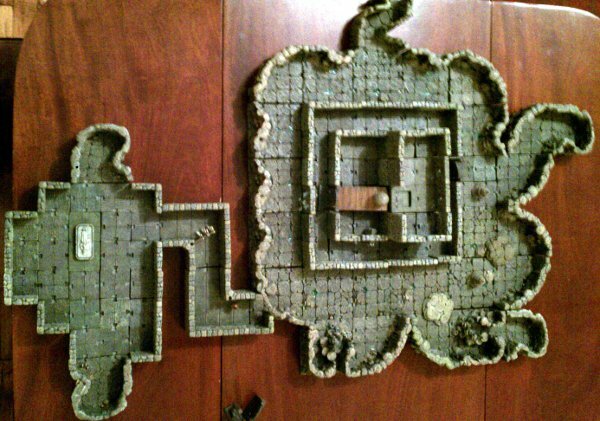 Terrain Challenge #1 is the first annual D&D competition using the fantastic miniatures terrain contributed to GaryCon by Pana. This year’s adventure imagines a roleplaying spin-off of Gary Gygax’s classic 1971 Chainmail scenario, Battle for the Brown Hills. Third level characters will be provided; all ages welcome. Unfortunately, as the event drew near, the happy expansion of Pana’s family interfered with the creation of the terrain around which this event was supposed to be based. As a parent I fully understand & support spending more time with a newborn than with dollhouses for boys, but this did leave me wondering how I was going to make the show go on. Because the event is short – two hours, including character generation – I think we’re going to start with the PCs having rappelled down to that central elevated structure, where the fallen treasure wagon has landed. The action of the game will involve them loading themselves up with as much gold as they want to risk carrying, searching for an exit from the dungeon, and trying to make it out alive! 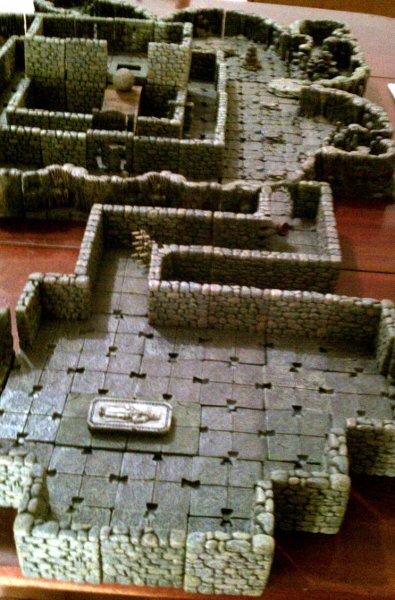 Thanks to the generous support of Dwarven Forge, I will be running this event not only at Gary Con but also at this year’s Arneson Memorial Gameday in NYC (about which more soon) and probably at an upcoming Recess as well. I’m really looking forward to having the chance to play with so much awesome dungeon goodness! You too can paint little greedy people. 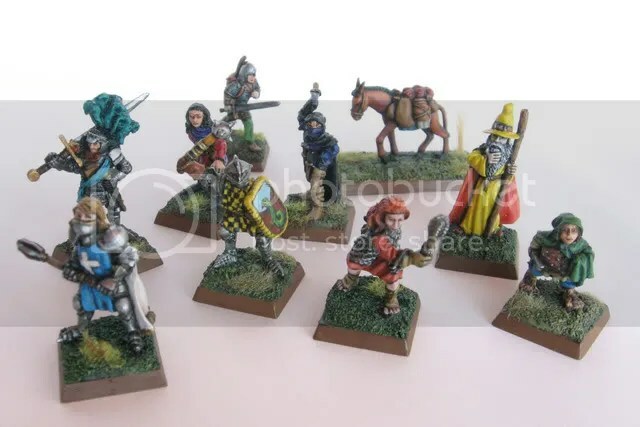 But damn it, back in the day, those painted minis in the glass case at the game store looked so cool. So fast-forward past my subsequent years earning a BFA and an MFA in painting and I am looking around the game table at our regular sessions. 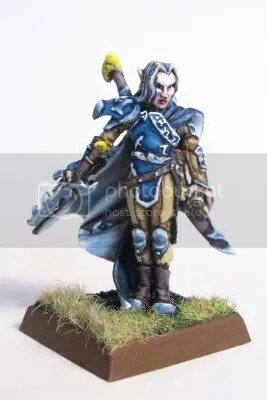 With up to ten people playing at a session, I was surprised to find that while many players had either a pre-painted D&D mini or a bare-metal representation of their character, practically no one was exhibiting the secret and profane art of miniature painting. After bringing in my box of minis I found that there were a number of other players at the table who still thought painted minis where awesome but never had the chance to take a leap into the actual brushwork. I decided to plan for a group painting day where I could share all my hard-won information about painting little tiny people for those without the benefit of the supplies or instruction. As a result I will be posting some outlines and advice over the coming weeks about how absolutely anybody can get started with painting their classic or new miniatures that they have collected. Hopefully this will allow even the most abominably unskilled artist to slap some colors on their nekkid mini, plop them on the table and be proud. Stay tuned.